805-967-6037 | Make Restaurant Reservations | Order Now! Offering healthy and flavorful California cuisine, Fresco Café is all about organic salads, sandwiches, wraps, pizzas and desserts. : Don’t let the strip mall location fool you. 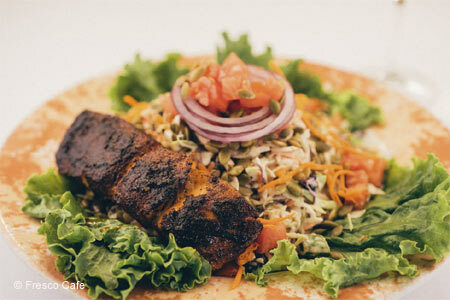 Fresco Café offers myriad combinations of organic salads, sandwiches, tortilla wraps and pizzas. Proprietors Jill and Mark Brouillard have made Fresco one of the city’s most consistent lunch spots --- and if you’re looking for reasonably priced food and don’t require much ambience, it’s a good dinner option as well. We like the Gruyère cheese melt with arugula and fresh tomatoes, and the warm spinach salad. Be sure to save room for desserts like the black bottom tart and flourless cupcakes. A small list of local wines and a few beers round out the experience. Also located at 442 Atterdag Rd., Solvang, 805-688-8857.